Metro Hospital was Founded by Padma Vibhushan, Padma Bhushan and Dr. B.C. Roy National Awardee Dr. Purushotam Lal. 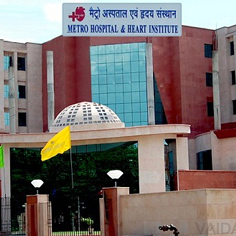 Metro Hospitals (also known as Metro Heart Hospital) are situated in the heart of Noida, and is run with the vision to make critical illness care affordable and provide best in class treatments through a mix of state of the art medical facilities and dependable and experienced doctors. Metro Group of Hospitals, a chain of 12 (2,500+ beds) avant-garde hospitals, scattered across the Northern Part of India, Out of which, seven hospitals of the Metro Group, including the metro hospital and heart institute are NABH Accredited and four are NABL Accredited. It is a well-trusted and verified institution that offers top class medical services to patients from all parts of the globe in the northern part of India. Cardiology & CTVS - Pioneers in multi-vessel beating heart surgery and bloodless heart surgery manage the Cardiology & CTVS department. Gastroenterology & Gastro Surgery - The highly experienced team of doctors offer treatment for highly specialized and complex surgeries to manage diseases of the GI tract. Neurology and Neurosurgery - Highly trained neuro specialists and surgeons treat diseases of the brain, nerves, muscles and spinal cord. Nephrology & Renal Transplant - Skilled consultants and surgeons use the multidisciplinary approach for congenital and acquired kidney diseases. Best in class dialysis and renal transplant are offered. Oncology & OncoSurgery - Best-in-class infrastructure is provided for surgery, radiation and/or cancer medicine therapy. Medical Oncologists, Surgeons and Radiation Oncologists work Orthopedics & Joint replacement.